Aesop Rock hasn’t ever truly met his potential, and this can be attributed to disharmony in his discography. The New York-born rapper loves strong beats as much as cerebral storytelling and stream-of-consciousness lyrical play, but his problem’s always been balancing the two. Labor Days bolstered abstract lyrics that had a spring in their step, but that were done a disservice with the album’s dry production that offered nothing new. None Shall Pass featured great production, but tracks that failed to come together as a coherent whole. Despite the flaws, though, each new Aesop release has always involved a high degree of hype, partially because we’ve all been waiting for the album that we know Ian Bavitz can make. His skills with production, his playful flow and vibrant lyricism all point towards a bombshell record encapsulating all of the man’s attributes. Aesop fans have been crossing their fingers behind their backs since the release of “Zero Dark Thirty,” silently hoping that Skelethon is the record where all the pieces fit just right. The pieces certainly do fit together, to contribute towards the most natural Aesop release in years. There’s a wide variety of ideas at play throughout the album, but never does the display of versatility feel forced. For instance, one aspect of the album that’s immediately noticeable is how it features many tracks that are among Aesop’s greatest. “Zero Dark Thirty” features an ominous beat that stands out as being remarkably memorable, the true sign of a great pick as first single. The song’s the equivalent to strolling through dim alleys in Chinatown, the sinister atmosphere pervading your imagination and carving shadows onto the walls before your eyes. Don’t get me wrong, though; “Zero Dark Thirty” is only one of the bombshells that Bavitz has included on his latest release. One important quality about Skelethon is that it’s defined by its organization. Its tracks span across many different styles - this requires a thoughtful tracklist to capture all the right moods. The album begins with ambition, an introduction that’s airy and saturated in reverb. This is more than one would expect from a prelude of Bavitz’s ilk, a sign of how much the lyricist believes in his latest offering. Cloudiness revamps itself into self-assurance shortly after, “ZZZ Top” possessing a funk-tinged swagger that comes together from one tom roll to the next. Aesop seems more comfortable in his own shoes than he’s ever been, in these key moments that jump out from the get-go. The subtlety and blatancy swirl together in an impressive fashion, but what’s even more endearing is the other areas that the record covers. During the middle of Skelethon, Aesop tinkers with different textural soundscapes as he pleases, even devising a two-part song in the mix. This can be viewed as where Bavitz falters a bit, in that “Crows 1” is too leisurely for its own good. The beat is diced so thoroughly that it’s hard to pinpoint a purpose, much less a reason for the concoction to be included in a two-parter. “Crows 2” is a stronger offering that offers memorable hooks through oriental leanings and foreboding themes, and sure, it’s more natural. Overall, though, these moments of the album come across as the product of a man trying a bit too hard, taking interesting turns but not necessary ones. It’s important to note that Skelethon occasionally constricts the listener, only to let loose moments later. Immediately after the Crows tracks is the hilarious “Racing Stripes”, which is a success just because of how laid back it is. Dichotomies like these are common on the album - while there aren’t a lot of weak moments, the ones that do are sandwiched by the unforgettable ones. An obvious example is the meaningful turn that the album takes during its home stretch. “Saturn Missiles” is arguably the pinnacle of Aesop Rock’s career, encapsulated into a track about as huge as its title would lead one to believe. This air of importance that surrounds the last three tracks is what ultimately makes the album leave such an undeniable footprint in Aesop’s discography, because he’s never taken himself quite this seriously. And isn’t it refreshing? 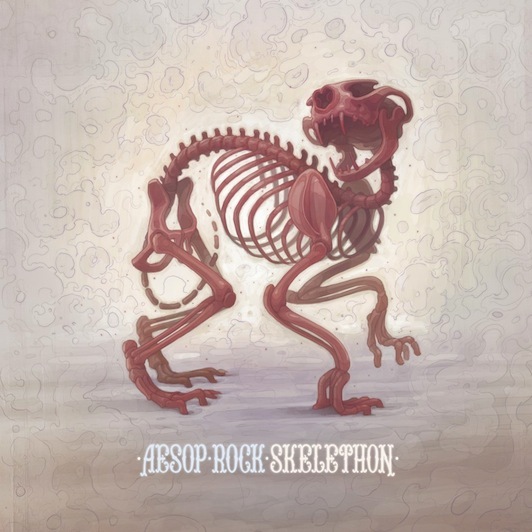 The most exciting aspect of Aesop Rock’s newest full-length is that it satisfies during its runtime, and this is a bigger step than one may assume. Ian Bavitz has always had a knack for creating unique hip-hop, but the following he’s amassed over the years seems to have been founded upon anticipation over all else. We’ve all been wanting him to create multiple tracks of the caliber of “Daylight” and “None Shall Pass,” longing for the musician to do something consistently great. See, the trouble’s always been that we Aesop fans have been living in the future. This is why I stress that Skelethon is an album based entirely on the present. The promises made at the beginning of “Leisureforce” are maintained all the way until the conclusion of “Gopher Guts,” a denouement to an album we knew would surface someday.